Kinshasa 06-02-2019 Politics - For the successor of José Eduardo dos Santos who received the new Congolese president in Luanda, the DRC and Angola should have agreements in the areas of security, public order and migration. 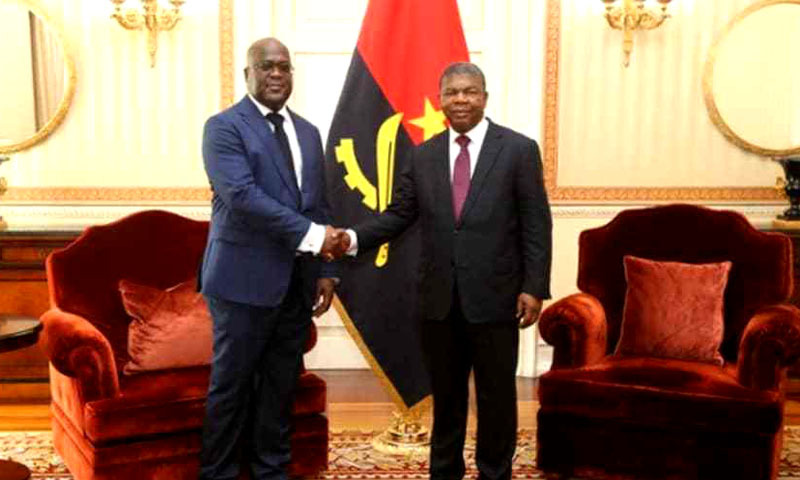 The Democratic Republic of Congo (DRC) and Angola should not neglect the security of the vast common border (over 2,500 km), Angolan President João Lourenço said. He spoke at a press conference in Luanda on Monday (February 4th) after a private meeting with his Congolese counterpart Félix Tshisekedi. According to him, both countries should have agreements in the areas of security, public order and migration. João Lourenço hopes that both countries will move from former intentions to concrete projects. According to the Angolan president quoted by the Angop Agency (Angola press), if the huge mineral resources "are exploited with reciprocal investments in both countries, the unemployment rate can be reduced. " He also mentioned the need to reorganize trade in general and cross-border trade in particular. João Lourenço has expressed interest in discussing and negotiating the supply of electricity to the Angolan provinces of Cabinda and Zaire and other border regions from the DRC. Angolan statesman proposes to better exploit Benguela Railways (BFC) and Lobito Port to facilitate the export of Katanga ores to international markets and to open doors for imports into the DRC. João Lourenço stressed that the two countries could share their experiences to overcome the problems of infrastructure, electrification, industrialization and unemployment. The Angolan president believes that both countries have much to offer each other, with mutual gains and many common challenges. This is Félix Tshisekedi's first foreign visit after his investiture as DRC President on January 24th. Fifty-five-year-old, DRC president Felix Tshisekedi is the leader of the Union for Democracy and Social Progress (UDPS), the largest and oldest opposition party in the Democratic Republic of Congo. After Angola, President Felix Tshisekedi traveled to Nairobi, Kenya. This is the second country he visits.